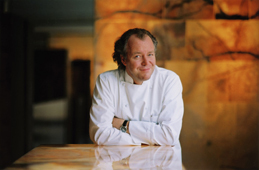 Michael Hoffmann is the owner and chef of Margaux in Berlin where his culinary philosophy is Cuisine Avantgarde Classique®. Chef Hoffmann grew up in Frankfurt, Germany, and despite being "very German" according to his wife and restaurant manager, Kathrin Hoffmann, "he must have French blood somewhere." Chef Hoffmann cooks from passion and dedication, and Kathrin joked, "the fish is so fresh it almost winks at you." Growing up, he loved working in the kitchen with his grandmother and he had his own vegetable and fruit gardens. Summer is Chef Hoffmann's favorite season where he uses up to 40 regional herbs in his cooking. His love of vegetables and herbs is readily apparent with his latest cookbook on herbs with 50 recipes due out in May or June 2007 that will be available for purchase at the restaurant. Chef Hoffmann is the German Ambassador of Vegetables, and he will travel to Spain to present a lecture on vegetables. In his free time, he spends one week each year teaching in Paris at l'Ecole Culinaire. I had dinner at Margaux in March 2007, and after tasting Chef Hoffmann's special dish of Glazed Winter Vegetables with Black Perigord Truffles, he would dispel any naysayer who does not believe you can have an interesting vegetable dish. Bravo Chef Hoffmann! Preparation: Clean all vegetables. Cut the shallots in half, leave the garlic whole, and roughly chop the leeks and cabbage. Roughly chop the tomatoes, bell pepper, and fennel. In a large pot, add cold water, spices, vegetables, and olive oil. Slowly bring to a boil and simmer for approximately 20 minutes. Add the fish and poach in the vegetable broth. Margaux is open for Dinner from 7:00 pm - 10:30 pm from Monday - Saturday. The restaurant is closed on Sunday. Read about Margaux in the Restaurants and in Chefs' Recipes (German version) sections. For more information on Berlin and Germany, please visit: www.Berlin-Tourist-Iinformation.com and www.Cometogermany.com.